This week (18-25 May) it’s Walk to School Week – where parents and children are encouraged to leave the car at home and experience the benefits of walking to and from school. The campaign is particularly important given recent evidence which suggests that the number of children who walk to school is falling. The most recent Department for Transport National Travel Survey found that only 42% of children walked to school regularly in 2013, compared to 47% in 1995/97. Indeed, Britain has one of the lowest levels of children walking or cycling to school in Europe. A recent YouGov survey of 1,000 parents of five- to 11-year olds in Great Britain found that speeding traffic was the main reason that parents no longer let their children walk to school. In particular, 39% felt that school-run traffic was dangerous. Almost two-thirds reported that they would like to see car-free zones outside both primary and secondary schools, as well as 20 mph speed limits in surrounding areas. The introduction of 20 mph speed limits and zones has received widespread interest of late, with a number of large schemes, such as the one planned in Edinburgh, capturing the headlines. The Edinburgh scheme is particularly notable for its scale. It covers over 80% of the city’s roads – effectively making 20 mph the default speed for all of its urban areas. Implementation is due to start in late 2015. At the other end of the UK, the London Borough of Hackney has this week begun the rollout of its own 20 mph scheme, through which more than 99% of the borough’s roads will become subject to 20 mph limits by October 2015. The Edinburgh and Hackney schemes join a host of others across the UK, including those in inner London, Liverpool, York, Bath, Bristol, Manchester, Newcastle, Brighton, Oxford and Glasgow. Numerous campaign and road safety groups have called for the greater implementation of 20 mph zones and limits across the UK, including the Royal Society for the Prevention of Accidents (RoSPA), Sustrans, the Campaign for Better Transport, CTC – the national cycling charity, 20’s Plenty for Us, The Slower Speeds Initiative and the European Transport Safety Council (ETSC). The UK Government have also shown support for the wider implementation of 20 mph zones and limits. In 2013, they published revised guidance to make it easier for local authorities to implement 20 mph limits and zones in their areas, and earlier this year, new guidance which further supports 20 mph limits was published by Transport Scotland. There is also clear evidence of the public’s desire for lower speed limits. A recent YouGov survey found that the majority of respondents supported the introduction of 20 mph speed limits in residential streets (65% support or strongly support) and busy shopping areas and busy streets (72%). Improved road safety and children’s safety were the key reasons for this, along with other reasons – such as making our streets more pleasant to live in, encouraging more walking and cycling, reducing noise and improving the quality of life. The YouGov survey echoes the findings of the British Social Attitudes Survey 2013, which found 68% of people to be in favour of 20 mile per hour speed limits in residential streets. But does the evidence support these anticipated benefits? One of the most commonly cited benefit of lower speed limits is improved road safety, resulting from a reduction in the number and severity of collisions. There is widespread evidence that this is the case – for example, research published in the BMJ in 2009 concluded that 20 mph zones were effective measures for reducing road injuries and deaths. Specifically, their introduction was associated with a 41.9% reduction in road casualties, with the effect being greatest in younger children and for the category of killed or seriously injured casualties. Similar findings have been reported elsewhere, for example, in a review of evidence reported to the London Road Safety Unit, in research by the DfT and by the SWOV Institute for Road Safety Research. There is also evidence that lower speed limits may help to tackle health inequalities. This is because children and young adults are more at risk of road traffic accidents within poorer localities than in richer urban neighbourhoods. Indeed, in January 2014, Danny Dorling, Halford Mackinder Professor of Geography at the University of Oxford, went as far as to claim that implementing 20 mph speed limits was the main way in which local authorities could effectively improve the health of the local population and reduce health inequalities. Similarly, research published in the Journal of Public Health in 2014 reported that targeting 20 mph zones in deprived areas may be beneficial. It also concluded that “20 mph zones and limits were effective means of improving public health via reduced accidents and injuries”. Improved public health is another often cited benefit of lower speed limits. Evidence from Bristol and Edinburgh demonstrates that 20 mph zones do indeed encourage increased levels of physical activity, including walking and cycling, and there is also evidence that they improve resident quality of life, through increased opportunities for social interaction and less noise and air pollution. The reduced levels of pollution also mean that lower speed limits can be better for the environment. Finally, there is also some evidence that 20 mph zones may result in increased local economic activity – with improved walking environments having many potential benefits for local business. Research conducted by Living Streets in London also found that pedestrians tended to spend more than those arriving by car. Despite the evidence in their favour, 20 mph zones are not always welcomed with open arms. There remain a number of concerns about the implementation of 20 mph zones, including fears that they may lead to increased levels of congestion, increased carbon emissions, suffer from a lack of enforcement, increase journey times, and increase emergency response times. Most of these concerns have been countered by research evidence; however, attitudinal barriers remain. In an analysis of a YouGov survey of public attitudes towards 20 mph zones, Professor Alan Tapp of UWE Bristol, reports that a sizable minority of people (31%) claim that ‘If a 20 mph speed limit is introduced, I may not stick to it’. He also points out that 49% felt that ‘It is just too difficult to stay at 20 mph’ and almost a third of people (30%) thought that 20 mph is an example of a nanny state. So despite the progress that has been made, there is clearly still some way to go before 20 mph limits and zones become a fully accepted part of UK towns and cities. 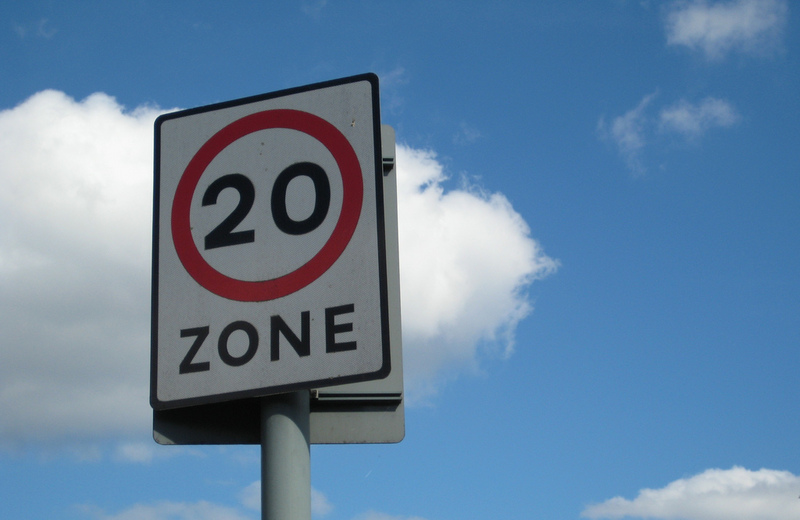 Implementing more 20 mph limits is only the start – it seems that there is also a need for local authorities to tackle the negative perceptions of 20 mph zones held by many drivers in order to ensure that 20 mph limits are adhered to in practice. Sharing evidence of the positive benefits of 20 mph zones and demonstrating that many of the main concerns associated with them are ill-founded is likely to play an important part in encouraging more positive attitudes, changing driver behaviour, and in turn, make streets safer and more enjoyable for children and adults alike. The Idox Information Service can give you access to further information on improving road safety. To find out more on how to become a member, contact us.